As an incredible summer of jazz slowly comes to an end with the arrival of the Vail Jazz Party, satisfying your Brazilian jazz craving on Saturday, September 2nd is the young, tender guitarist Diego Figueiredo. With fingers lightly touching just over the nylon strings, his harmony sets in over the frets. 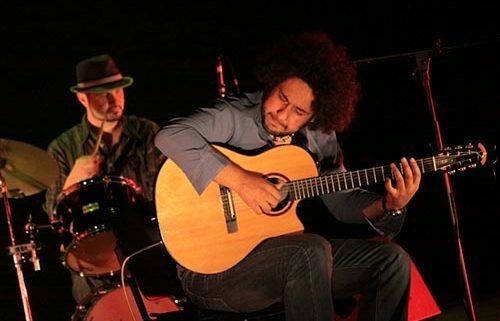 Known for leaving audiences all over the world feeling joyous, this young rising musician from Brazil brings the true essence and character of Brazilian music, while also bringing elements that are quite modern and innovative with his virtuoso playing. With a casual and relaxed demeanor on stage (often playing barefoot! ), he instantly transports you to the sounds of Brazil. The acoustic sounds of swing, samba, choro, bossa nova, and maracatu all soak in and make you embody the nature, nightlife, and tranquility of this culture. It’s no wonder with the latest Olympic games in Rio de Janeiro, why sports fans and musicians alike can’t seem to get enough of Brazil! So why is Brazilian jazz so attractive and addicting? Is it the way the singer’s lyrics in Portuguese flow so smoothly? Or the catchy hooks made famous by Antonio Carlos Jobim? Or the groovy syncopated rhythms of Ivan Lins? Jazz listeners across the world today, are still captivated by the unique songs of Brazil, which are completely separate from Latin jazz. While many people may associate Latin and Brazilian jazz as one style of music altogether, there are in fact distinctions among the two. One being that Brazilian jazz was heavily influenced by Portugal and Africa, while Latin jazz blending the Spanish and Caribbean sounds together. Another difference is in instrumentation, Brazil known for its Agogo, Pandeiro, and the Berimbau while the claves, timbales and congas heat up Latin America. Each type of jazz having it’s own specific rhythms and harmonies reflecting of its own culture. Diego will perform throughout the Vail Jazz Party – Let the sweet, cool sounds of this exotic country and Brazilian guitar take you away this summer!